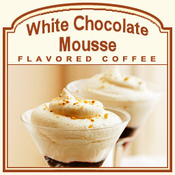 White Chocolate Mousse is one of the most decadent flavors of all time, and now you can experience its glorious creaminess in the White Chocolate Mousse flavored coffee. Made with 100% Arabica beans, this White Chocolate Mousse is a rich full-bodied coffee that features the best white chocolate flavors available. With only 2 calories in each cup, your taste buds will go wild for this dessert-inspired coffee treat. Packaged in a heat-sealed valve bag to ensure the freshest coffee possible, this White Chocolate Mousse will be roasted and shipped on the same day. 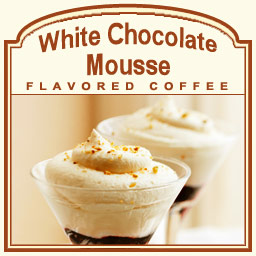 This melt-in-your-mouth White Chocolate Mousse flavored coffee will feature an aroma and a flavor that will be hard to forget for anyone that loves high-end desserts. Creamy and smooth, let the White Chocolate Mousse wash over you with its dreamy deliciousness.